Clarke University’s fifth annual Clarke Day and 175th Founders’ Day celebrations will take place on Thursday, October 4, 2018. This is a day for alumni, students, faculty, staff, and friends to share their Clarke Pride on campus and through social media. All are invited to post photos and interact on Facebook, Twitter, Instagram, and Snapchat using the hashtag #ClarkeDay. The Clarke community can get involved in this celebratory day by by wearing blue and gold and posting a selfie on social media using the hashtag #ClarkeDay. Individuals may also choose to make a gift on the Clarke website at clarke.edu/clarkeday. All gifts made to the Student Scholarship Fund on Clarke Day will be matched dollar-for-dollar by the Wahlert family. 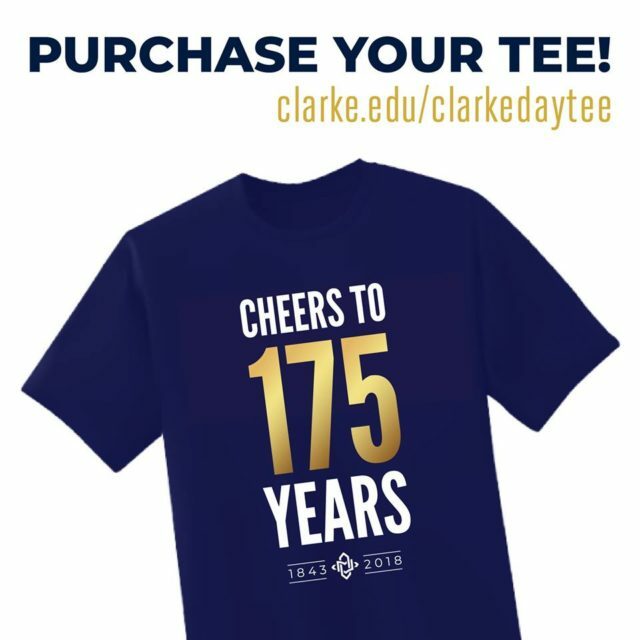 Clarke supporters are encouraged to celebrate Clarke’s 175th anniversary with a commemorative t-shirt. T-shirts are available on Clarke’s website at clarke.edu/clarkedaytee for a tax deductible gift of $20. Clarke students are offered a discounted rate of $5 per t-shirt. On October 4, Clarke will also celebrate Founders’ Day beginning with a campus Mass and community lunch. Festivities will continue after lunch with the naming of the Barwick Eppel Mail Center. This special designation recognizes Srs. Ramona Barwick and Rachel Eppel for more than 80 years of collective service and dedication to the Clarke community. Visit clarke.edu/clarkeday or call (563)588-6585 for more information.